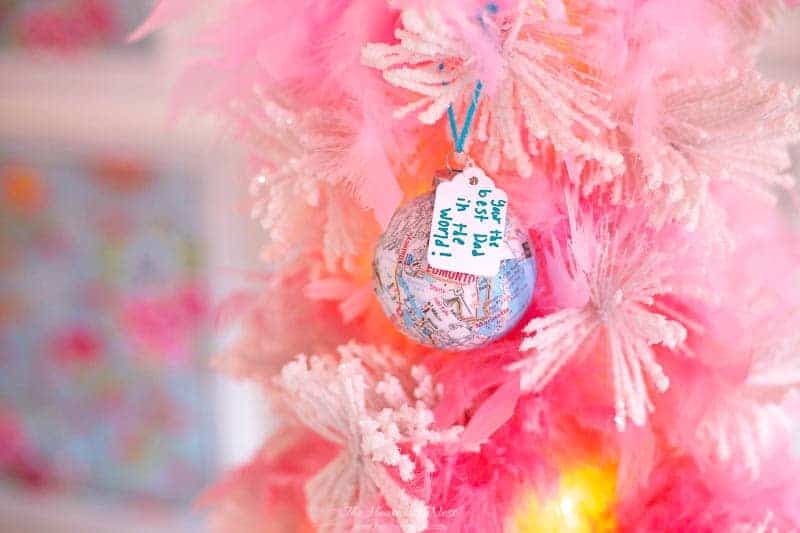 Looking for some easy DIY gift tag ideas this Christmas? Look no further. 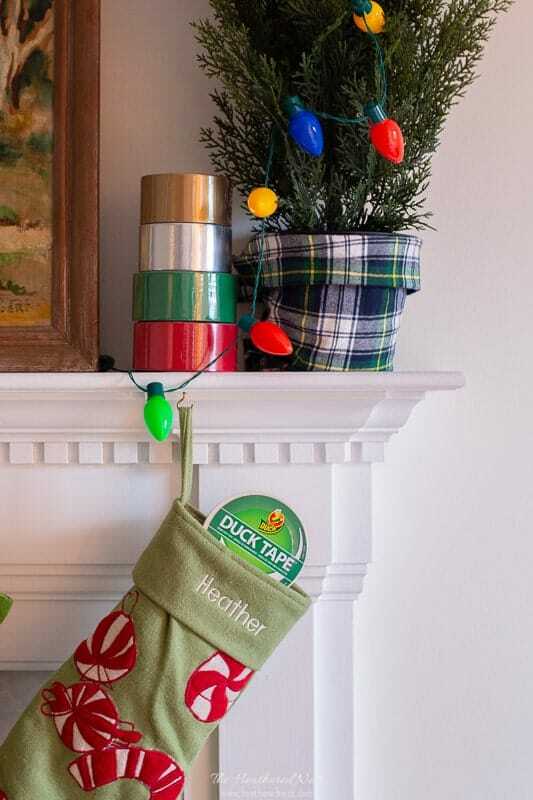 Check out this gorgeous Duck® brand duct tape craft, perfect for the holiday season! My daughter is a Duck Tape fanatic. 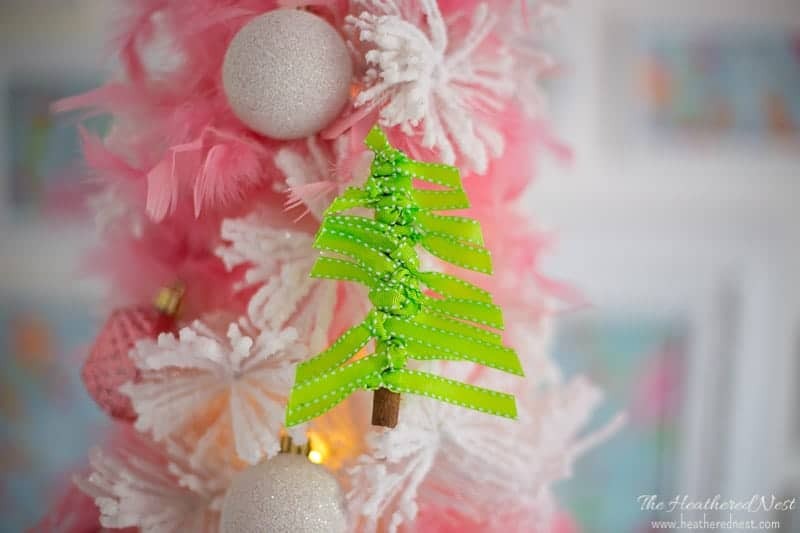 She asks for different patterns and colors each Christmas because she enjoys making all kinds of different crafts with her Duck Tape. There are Duck Tape rolls with cacti, ducks, whales, metallics, glitter…even a glow-in-the-dark variety! 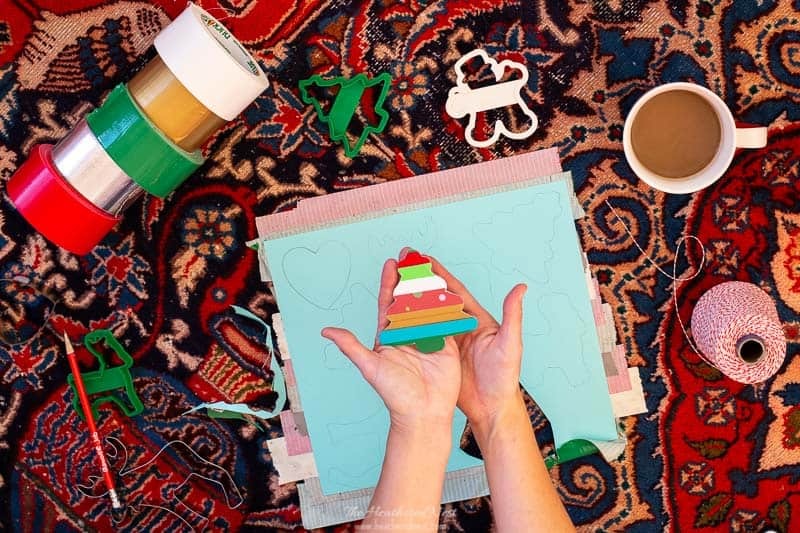 So this year, we used our Duck Tape stash and got crafty together making these fun and festive DIY gift tags. 1.) Cut strips of scrapbook paper. 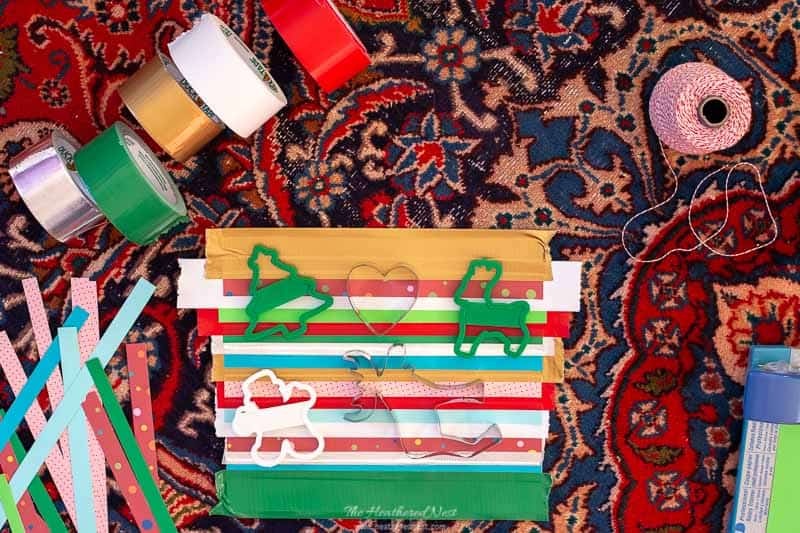 We’ll be using strips of festive scrapbook paper to mix in with our colorful Duck Tape for the gift tags. 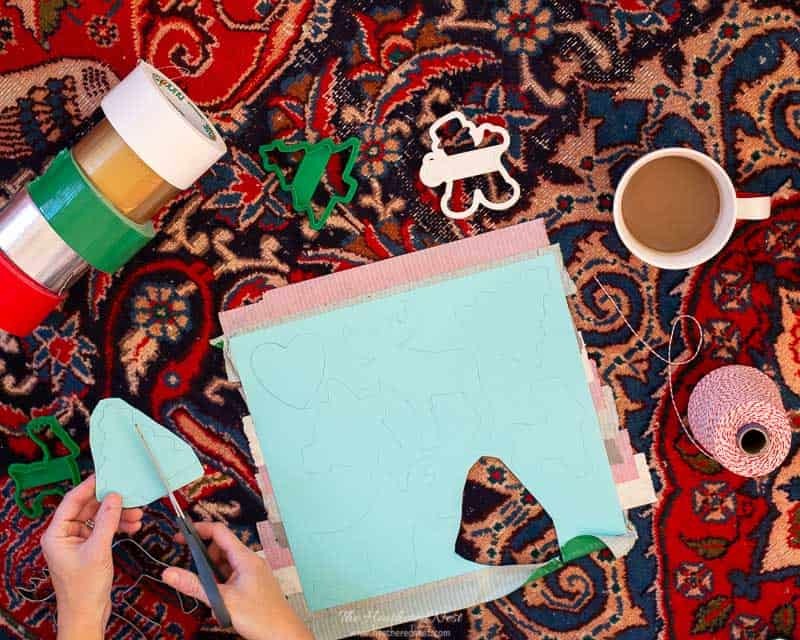 Start by cutting strips of a few pieces of scrapbook paper you like. 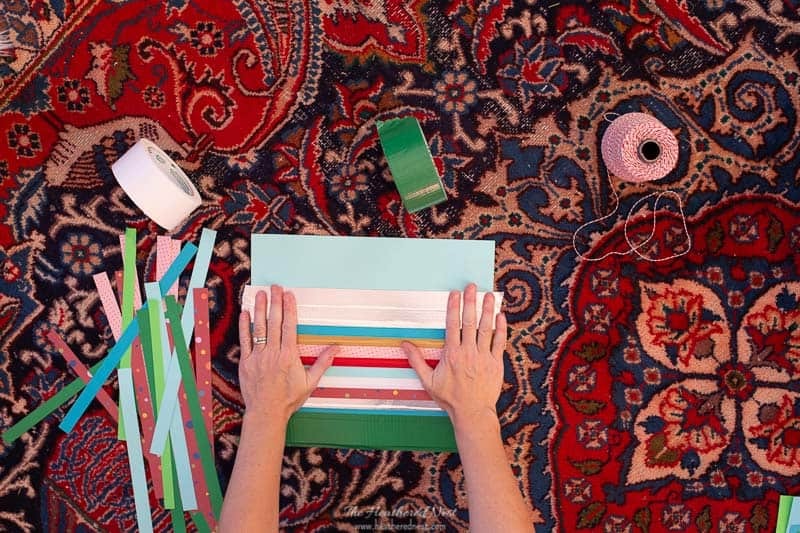 Once you’ve gathered a handful of paper strips, you can move on to the next step. If you end up needing more strips later on, just cut some at that point. 2.) 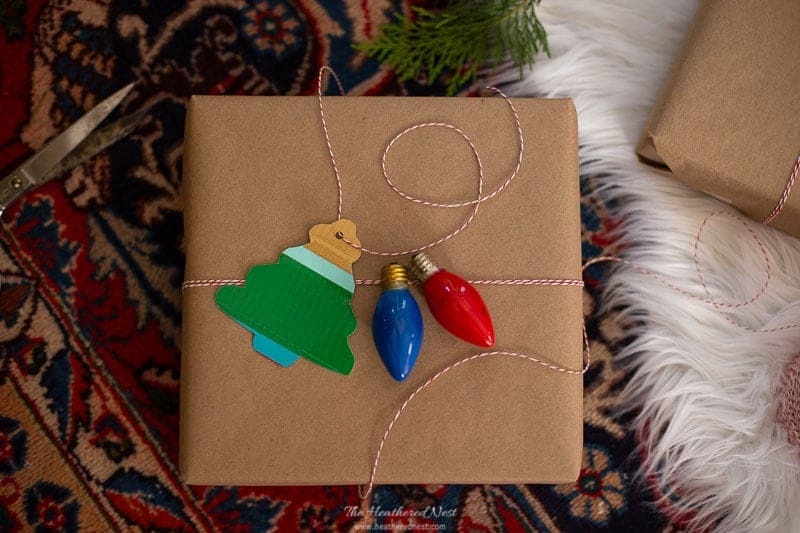 Select a piece of scrapbook paper for the back of gift tags. Pick a piece of scrapbook paper you like. Remember that you’ll be writing the “to” and “from” on this paper, so something that is less busy is best. 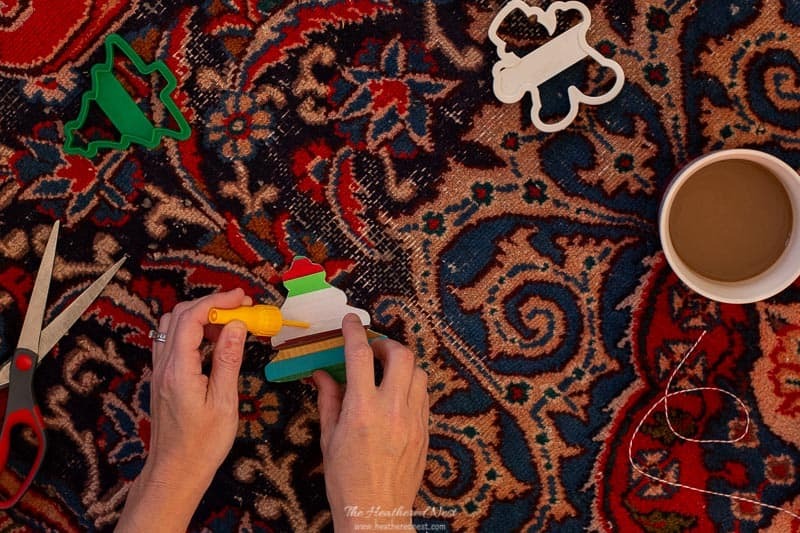 Lay the “good side” of your paper down facing the table or floor. We’ll be taping the paper strips and Duck Tape onto the “bad” side of your scrapbook paper “backer”. 3.) 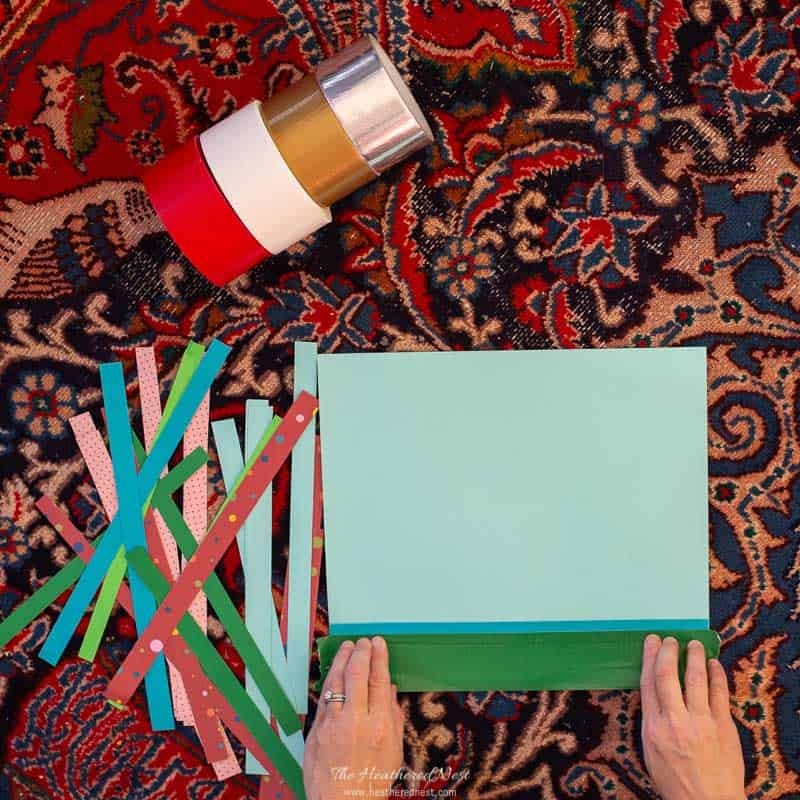 Start affixing strips of scrapbook paper and Duck Tape to your sheet of scrapbook paper. 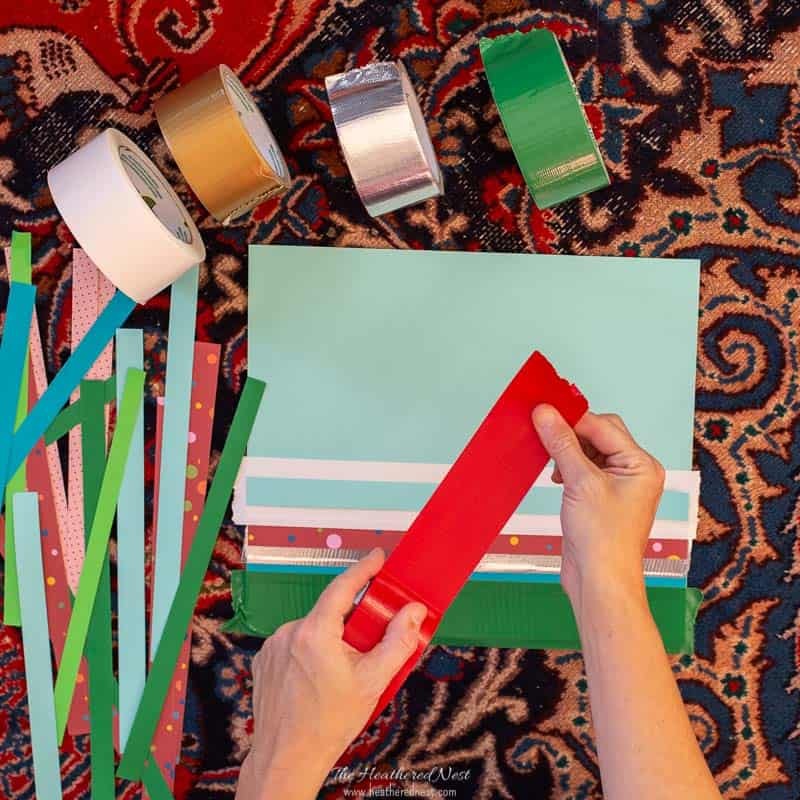 As you do this, try and secure the ends of your scrapbook paper strips with the Duck Tape. You won’t be able to do that for every section if you’re overlapping the sections closely, which is ok. We’ll take care of those loose ends later. 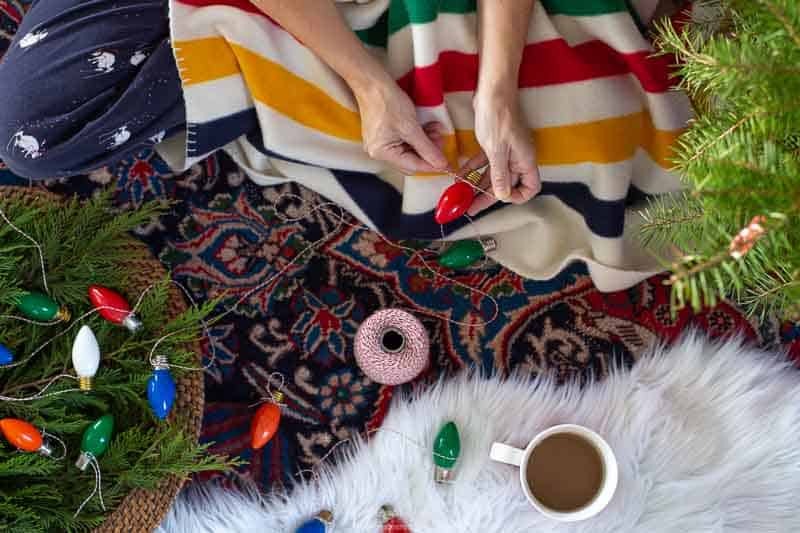 Remember that your gift tag won’t be huge, so making your stripes smaller will give you the most colorful look! 3.) Continue layering stripes of Duck Tape and scrapbook paper. Keep working your way toward the opposite side of your scrapbook paper backer. 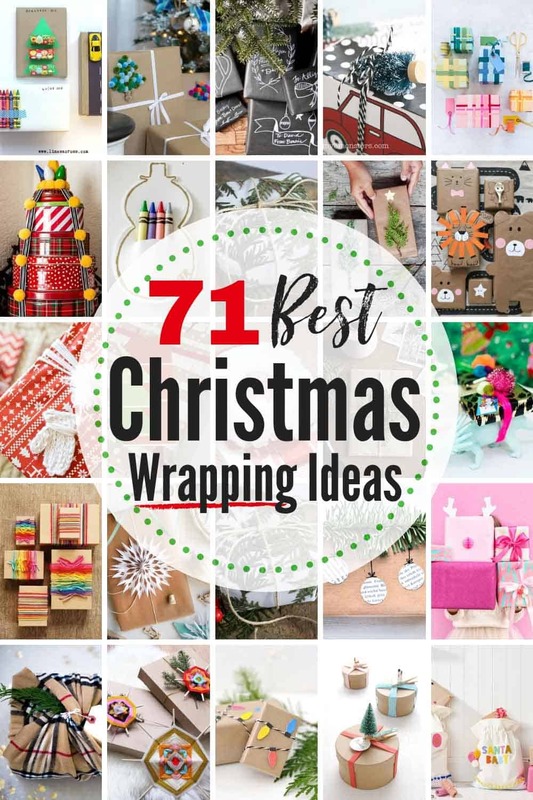 You’ll want the whole page of scrapbook paper covered in layers/stripes of tape and paper strips. 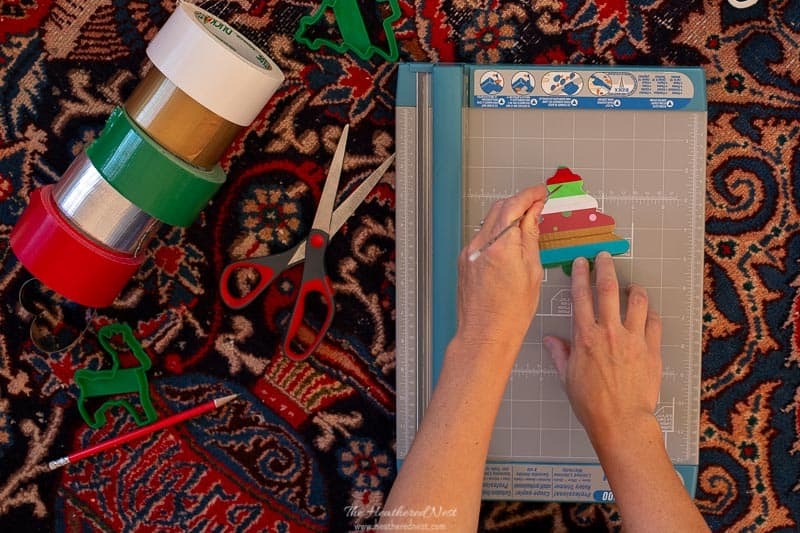 Once your scrapbook paper backing is completely covered with stripes, lay your cookie cutters out on the striped side first. You can trace them on the flip side however you want so that your tags have horizontal, vertical, or stripes on a bias. 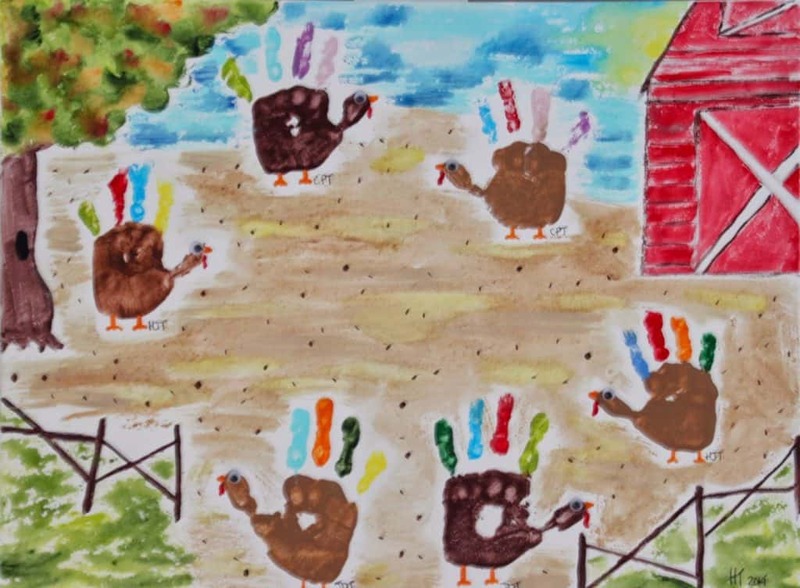 Now flip the taped paper over, and trace the cookie cutter patterns onto the paper. 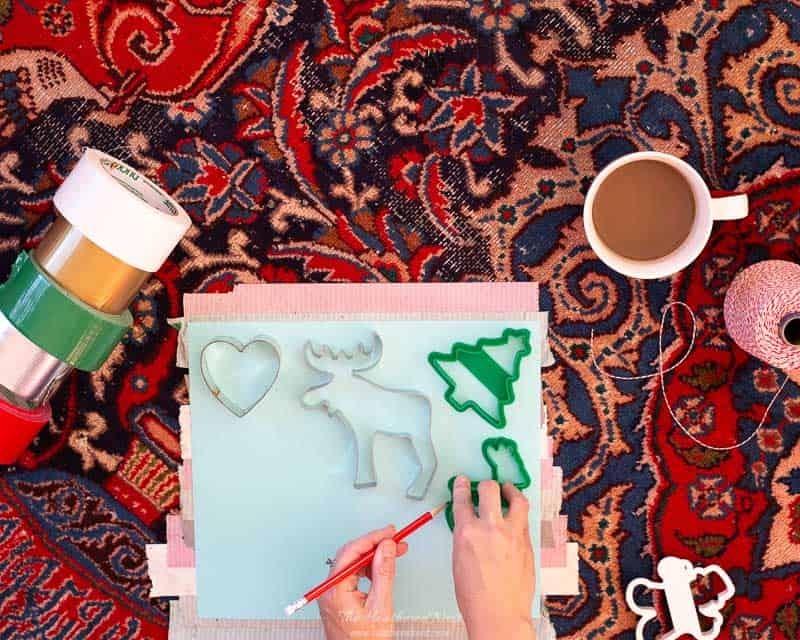 It’s time to grab your scissors and cut out your traced shapes. 6.) Glue down any unsecured edges. 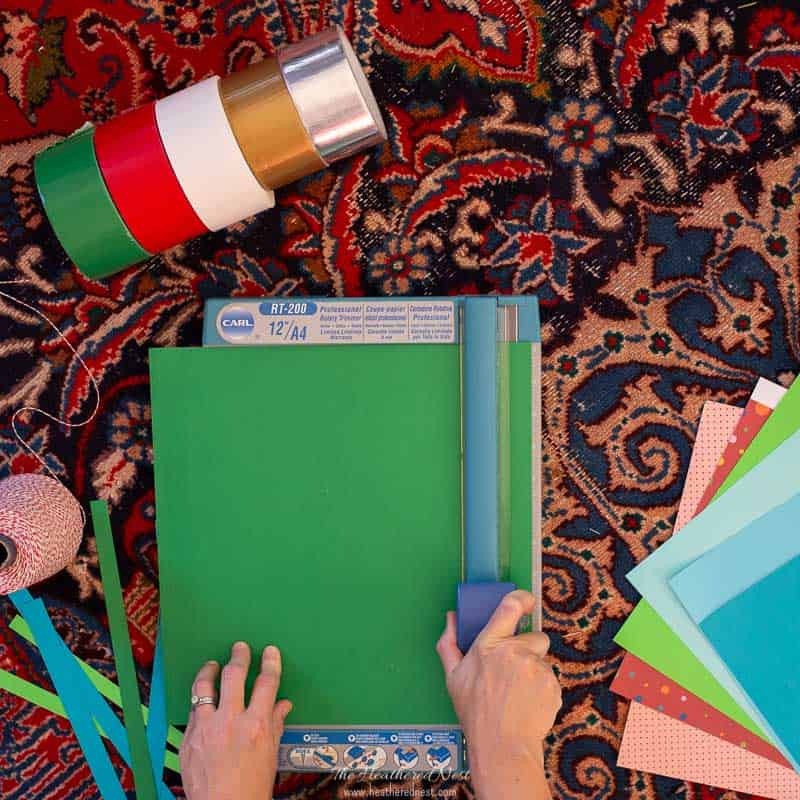 You’ll need to glue down any ends of scrapbook paper that weren’t already secured with the Duck Tape. Make sure to use a clear-drying product. 7.) 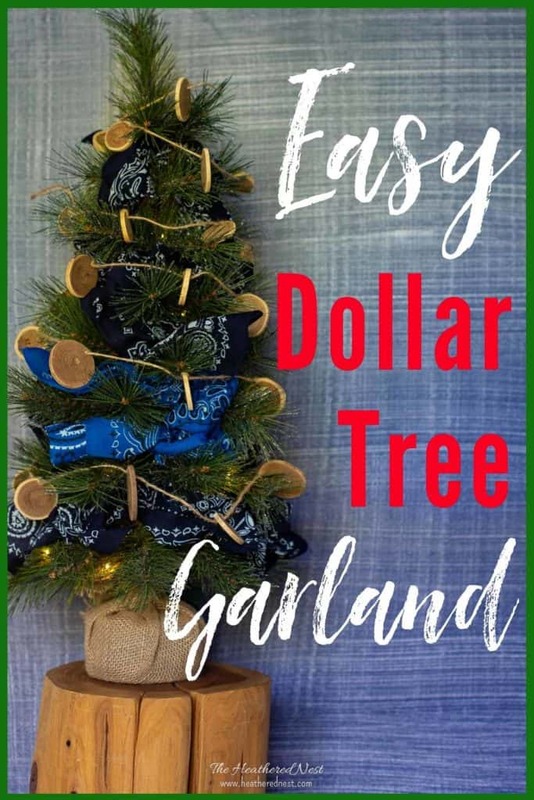 Make a hole and string butcher twine or ribbon through the tag. 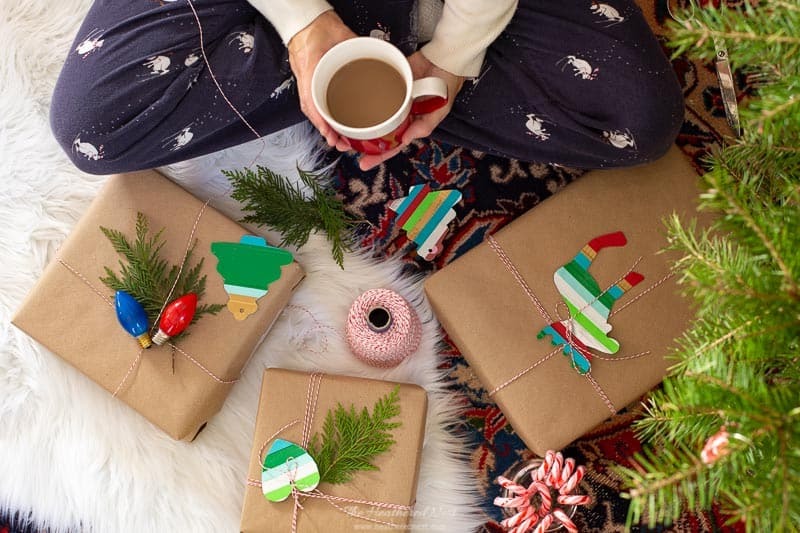 Use the tip of your scissors, or a small screwdriver or punch to create a small hole in the top, center of your gift tag. This is where we’ll string the tag. 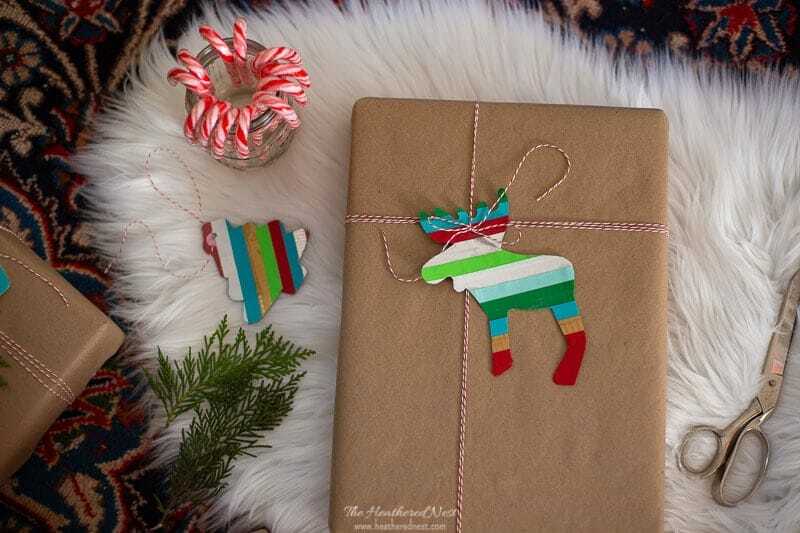 Insert your butcher twine or ribbon through the hole, and wrap your gift in style! 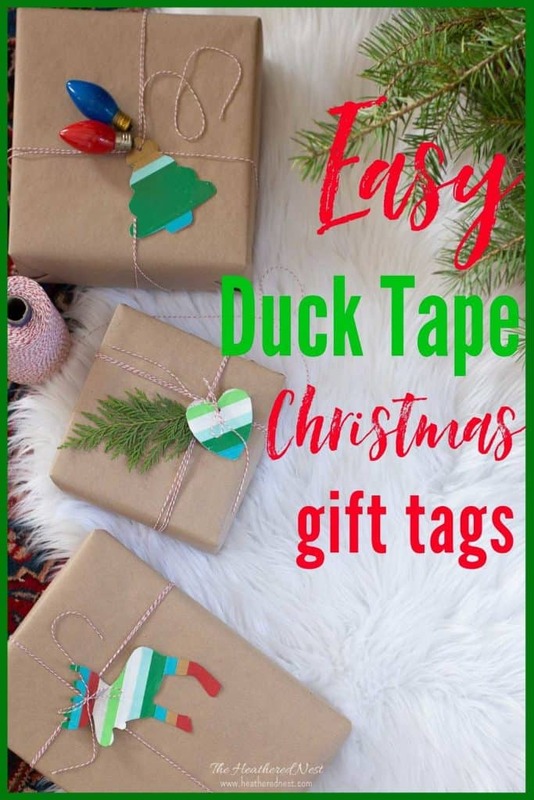 These Duck Tape gift tags can be made in batches, as you can see. 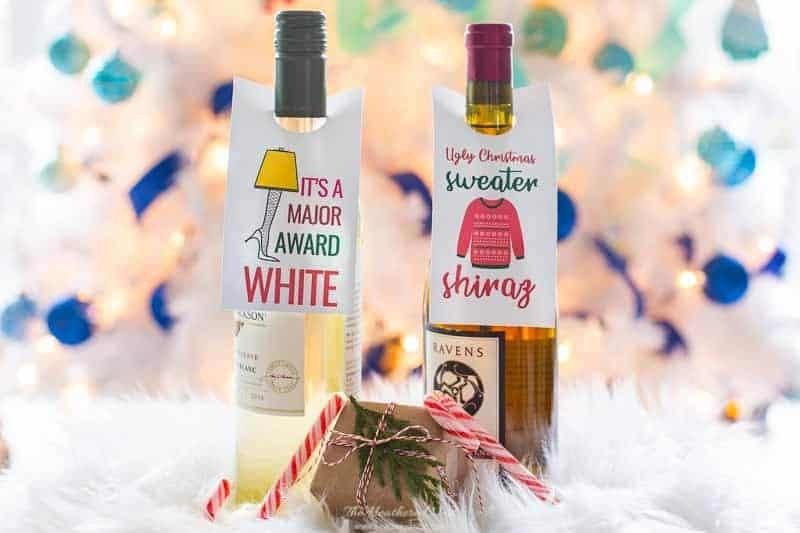 They create such a festive, colorful gift. 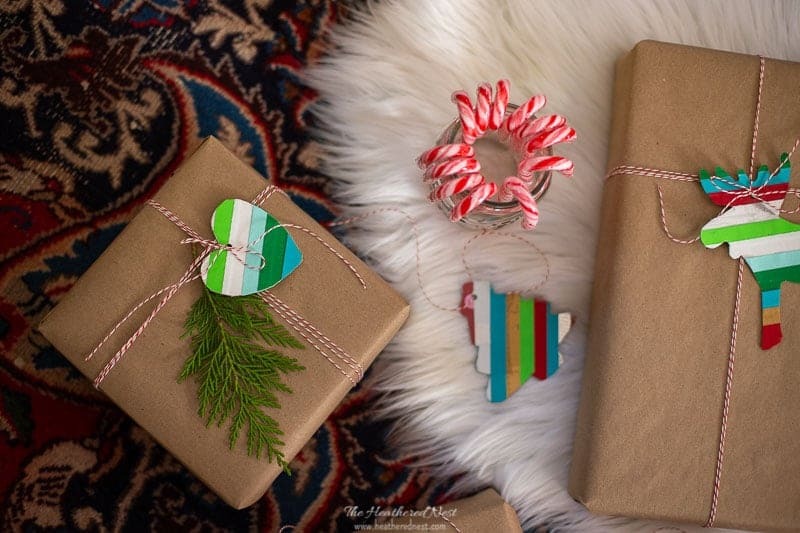 And I love them paired with a plain kraft paper wrapping job, don’t you? 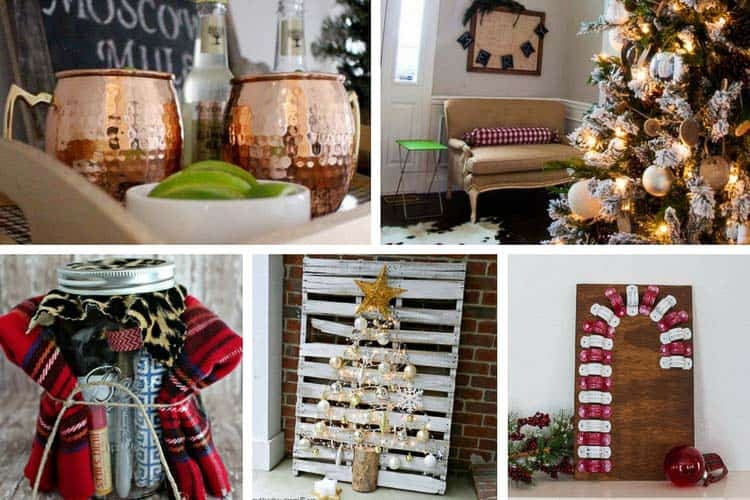 This is a really great craft for a winter PJ and Christmas movie kind of day!! 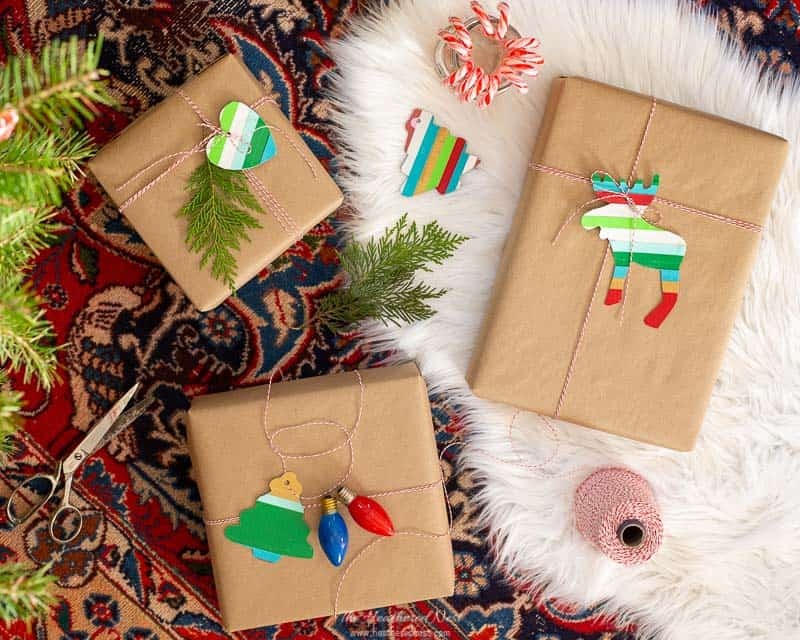 So grab some colorful Duck Tape, and gift some this season if you have a crafty-type in the family. There are so many fun projects to be done with this useful supply! 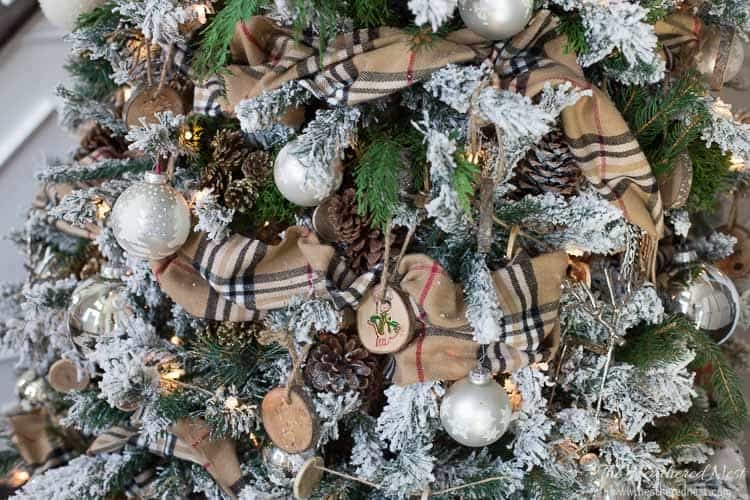 Happy holidays!! 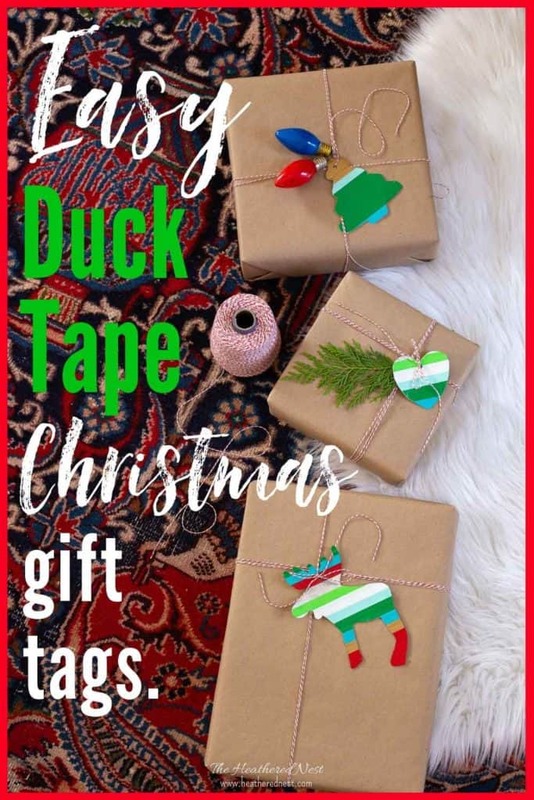 Pin this Christmas gift tag Duck Tape craft post for later! 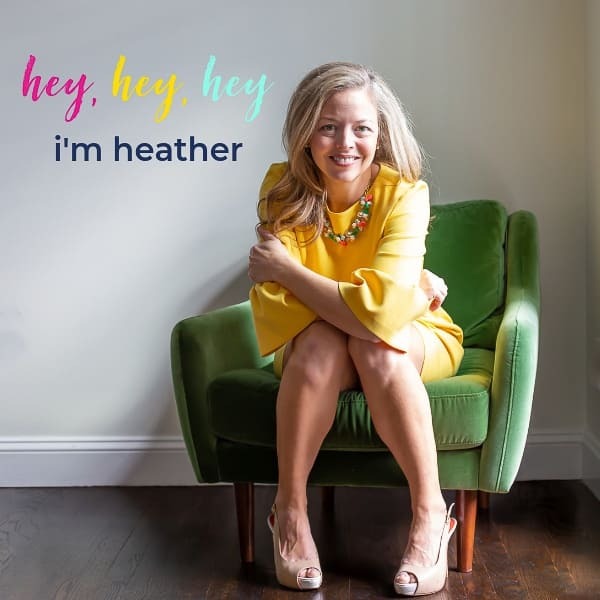 And if you make one, leave a comment (or better yet, a photo) on the pin! 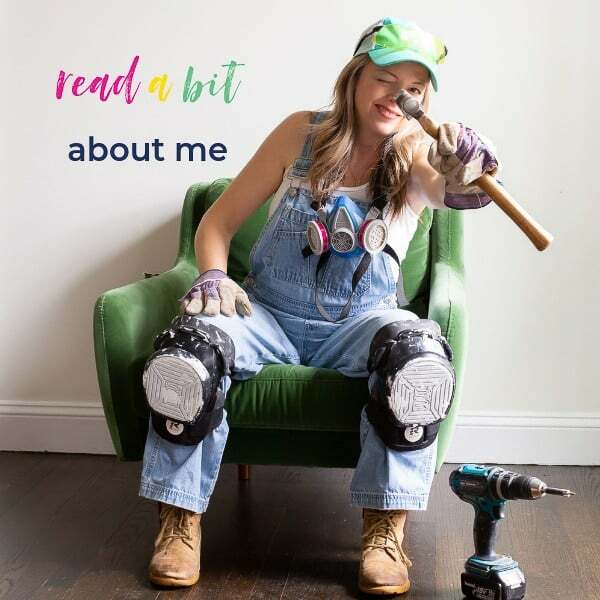 That helps others know whether they want to try this project, too!